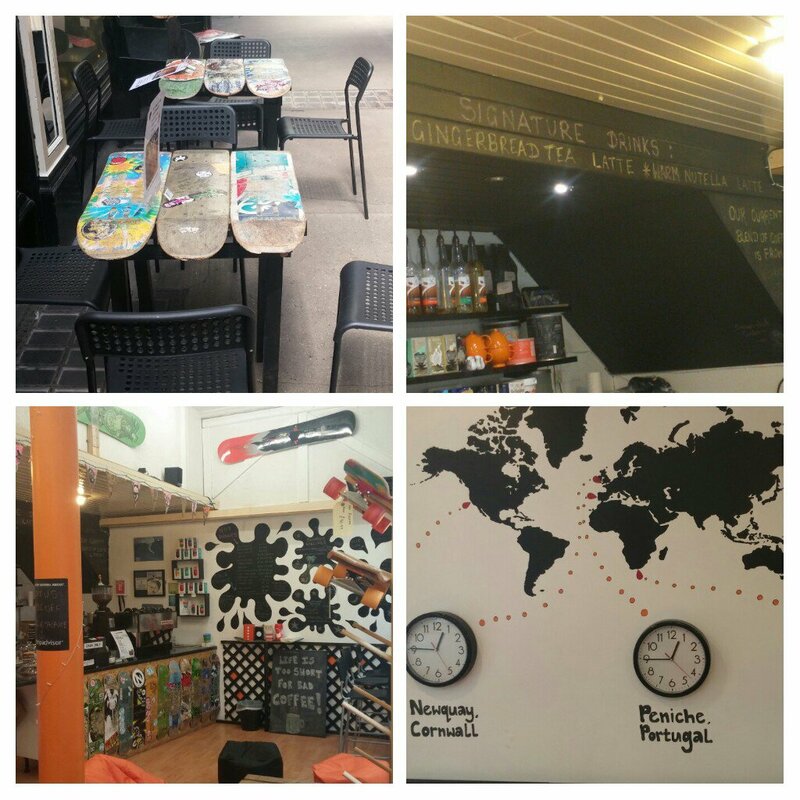 Getting on board with one of Cardiff’s Independents – Boardroom Coffee shop – Closed. When you think of lunch in the boardroom, you would be forgiven for thinking of a sumptuous room with a massive mahogany table dripping with the trappings of wealth and excess (it is what comes to my mind anyhow). These are places meant to impress (the client) or intimidate (the opposition). An “in your face – look how successful and thus how good at what we do we must be” statement. I suppose it is because I am a commercial lawyer that I associate boards and boardrooms with the corporate world. 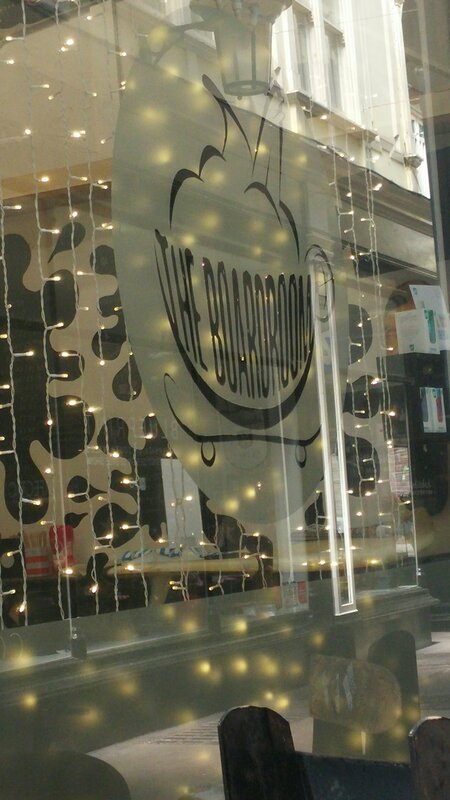 The Boardroom in Cardiff, however, takes a somewhat different spin on the word. In their case it relates to skateboards (I am old enough to remember when the craze for these first hit the UK, had one and – to those who know me unsurprisingly – I was absolutely useless on it as anything that require balance and coordination is totally alien to me), surfboards, snowboards and other trappings of the counter – culture sports world. Despite me being about as far as you can get from a surfer or skater dude as is possible in this universe (and probably many parallel ones), it has been on my radar for a while as a place to visit. Reports I have heard have all been positive on both the food and drink front and I love a good independent. Finding myself up at the castle end of town, I thought why not pop in. Inside it is what I would call shabby chic (mainly because I have no idea what that really means – chic that is, shabby I know all about) and can’t really describe the decor). Surf and skater paraphernalia abounds and there are clocks with the times for surfing hot spots (on a map) and skateboards etc for sale on the wall. Table are made from recycled skateboards, which work surprisingly well. The seats aren’t the most comfortable, however, even for someone with my ample padding. Despite my middle-aged staidness and innate grumpiness I rather liked the place. Easy place to wile away a lunch hour (would help if the seats were a bit more comfy) with a book/the internet (free WiFi is pleasingly available). Food wise the offering is quite limited, covering bagel and cakes. I would say more snacks than a full-blown lunch, but perfectly fine as an alternative to a sarnie or a salad are your desk. 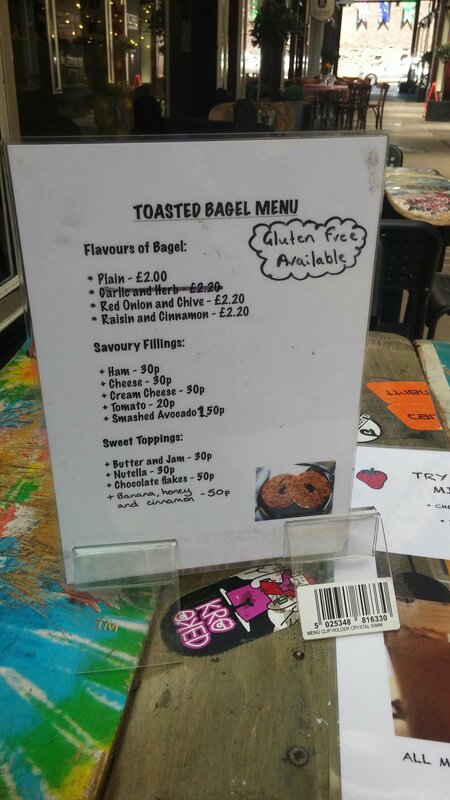 offers bagels, bagels and well bagels. 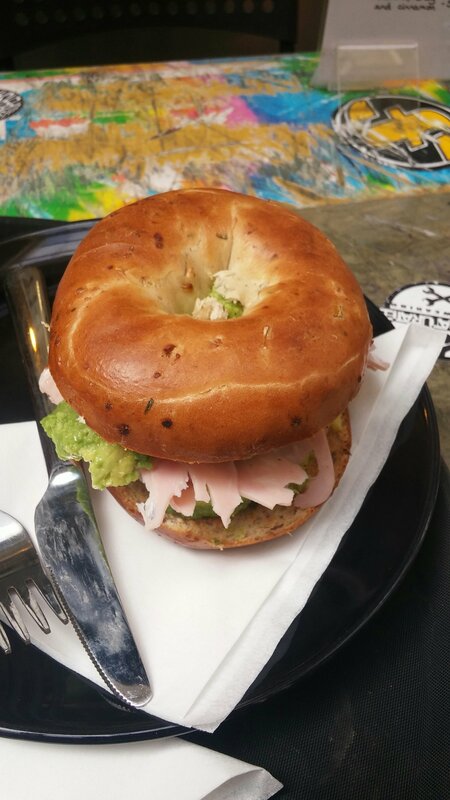 A variety of toppings (savoury and sweet) are available to add to your toasted bagel. Nicely ripe flavoursome avocado, which was properly seasoned, but it was a bit of a shame that the ham was of the somewhat plasticy variety. Overall very enjoyable and I happily paid £4 for it (the ever rising price of avocado accounting for a good chunk of this). Some may baulk at that price, but compare it to Starbucks and Costa (plus supermarket takeout sarnies) and it is more than fair in my view. 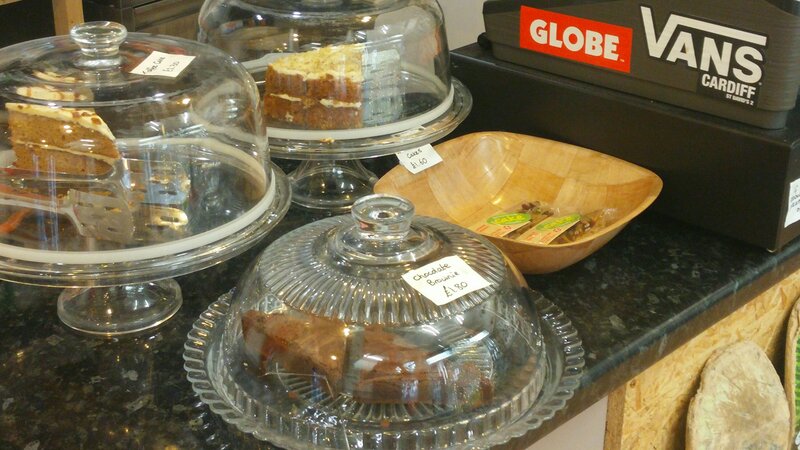 Nice looking cakes are also on offer. The £1.80 brownie looked particularly tempting. 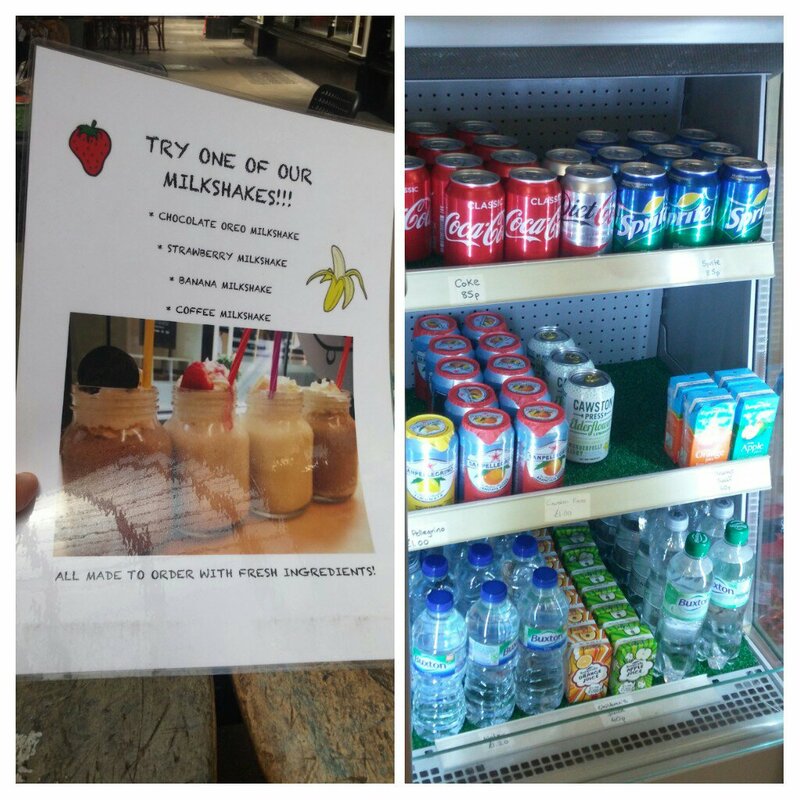 Coffees, shakes and smoothies are the name of the game here. On a blisteringly hot day (oh how I hate working in an office on sunny days), a hot coffee was off the agenda. I am a bit of boring/traditionalist kinda guy when it comes to coffee (don’t like funny flavoured stuff) and find a lot of the ice lattes and their ilk a bit sickly so these were also disregarded by me. but the smoothies were what really piqued my interest. I originally (in keeping with the green colour theme of my avocado stuffed bagel) wanted on a Green Reviver, a rather interesting blend of banana, kale, mango, lemongrass and apple juice. This was, however, unavailable so “berry burst” (£3) it was. 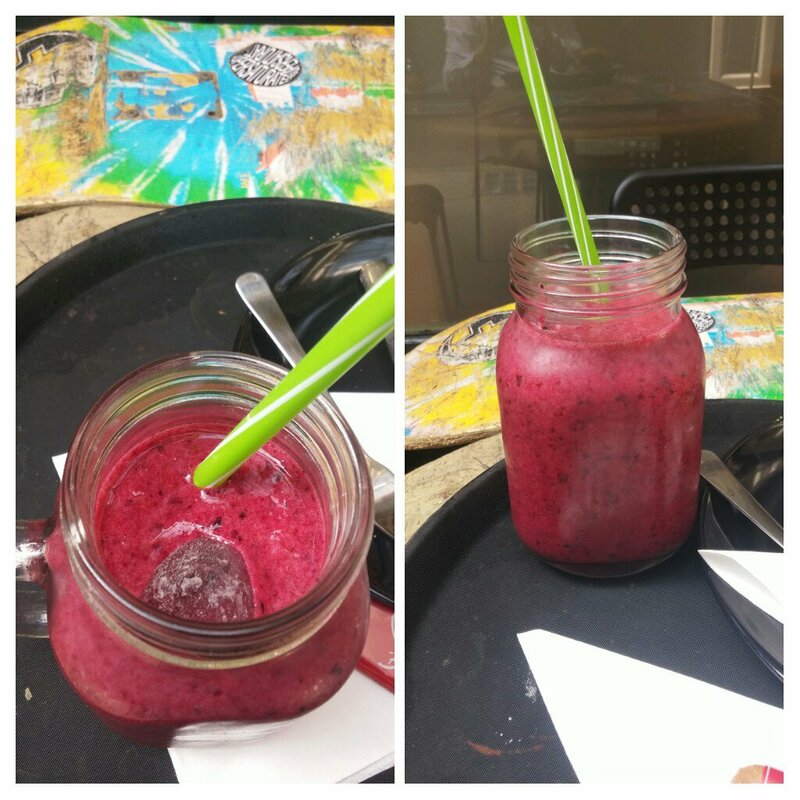 This combination of blackcurrants, blueberries, banana, blackberries and apple juice was absolutely lovely. Nicely chilled and really refreshingly (with big chunks of ice in there), it was full of virtuous black fruit. Just the ticket for a steaming hot May lunch time. On a colder day I would certainly be tempted by their standard coffees. I rather liked the Boardroom. The offering in short, but well-formed, and I was well feed and watered on my visit there. They also allow you to be virtuous by the ability to add to your bill one of their “suspended coffee” (a hot drink that a homeless person can claim later). I did and it make me feel better (and have someone a much needed drink), so two quid well spent I would say. Maybe it was due to the warm weather, but I was the only person in there on a Friday lunch time. This to my mind is a shame and I hope it was an aberration due to the warm weather rather than the norm. Cardiff really needs to appreciate its independents. Why go to Starbucks and Costa et al when you have places like this. Use it or loss it as the saying goes and independents are what makes a City, in my view. Gives a place character. I mean who wants identikit high streets? Would I go back? 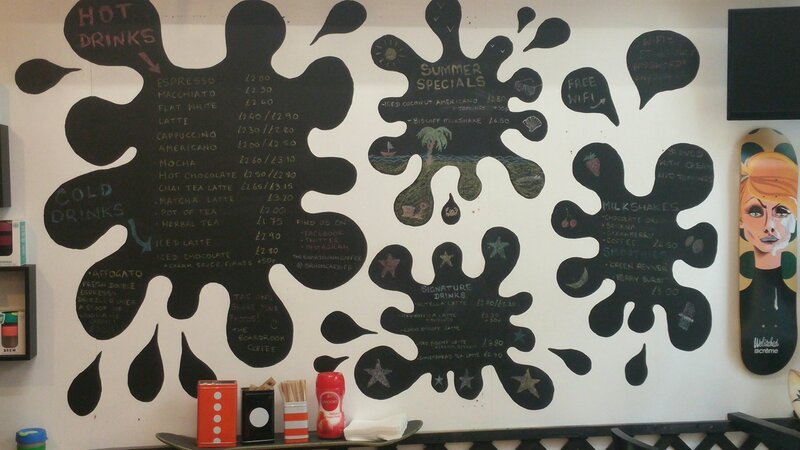 Absolutely – nice bagel and a killer smoothie (plus a soothing of conscience in terms of buying one of their suspension coffees). Opening hours: Tues – Friday : 10.00 – 17.00; Sat: 10.00 – 17.30; Closed : Sun & Mon. 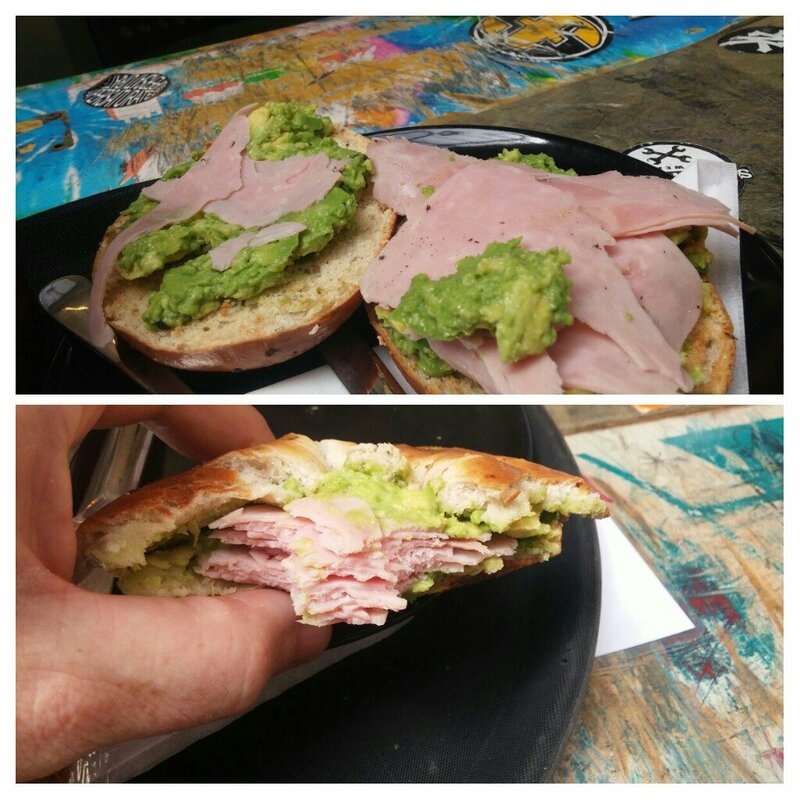 This entry was posted on May 28, 2017 by solicitingflavours in American food, Bagels, cafe, cake, Cardiff, coffee, Drink, Food, Gluten free, Lunch, lunchtime, milk shakes, Non alcoholic drink, restaurant review, retail, review, Sandwich, smoothies, Take away, Takeaway, The Boardroom, Uncategorized, Wales.